New Delhi, March 2: India on Saturday reiterated Jammu and Kashmir is its an integral part and an internal affair. The Ministry of External Affairs (MEA) released a statement on a resolution on Kashmir at the Organisation of Islamic Cooperation (OIC) and made it clear that no external party would involve in the matter. India also thanked the OIC for inviting Sushma Swaraj as ‘Guest of Honour’, MEA stated. “As regards the resolutions on Jammu and Kashmir, our stand is consistent and well known. We reaffirm that Jammu & Kashmir is an integral part of India and is a matter strictly internal to India,” read the statement released by the MEA. This was in response to Pakistan’s Foreign Office’s statement that the OIC passed a resolution that ‘supported’ Pakistan on the Kashmir issue. 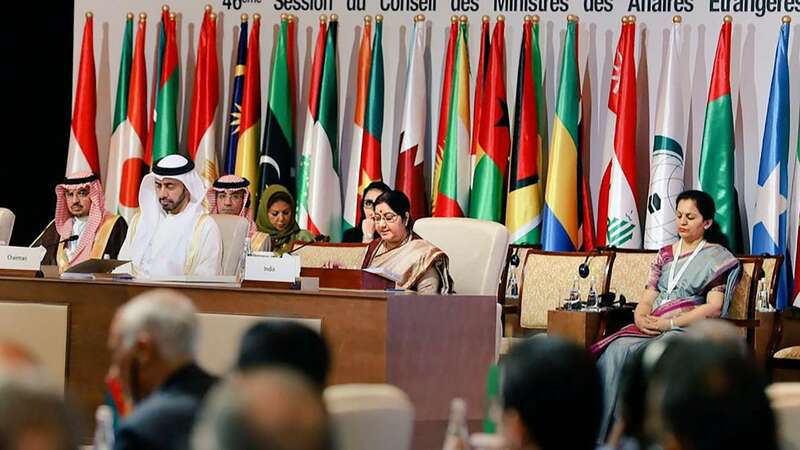 Sushma Swaraj at OIC Meet 2019: EAM Makes Veiled Attack On Pakistan For Funding Terrorism, Says ‘Terror Not Linked To One Religion’. “In a resolution, the OIC member states reiterated that Jammu and Kashmir remains the core dispute between Pakistan and India and its resolution is indispensable for the dream for peace in South Asia,” Pakistan’s Foreign Office (FO) claimed. The resolution also “expressed deep concern” over the alleged human rights violations in Kashmir, the FO claimed, adding that the resolution also reminded the international community of its obligation to ensure implementation of UN Security Council resolutions on the Kashmir dispute. The FO said that in the context of current volatile situation in the region, the OIC member states adopted a new resolution sponsored by Pakistan, “which expressed grave concern over the Indian violation of Pakistani airspace; affirmed Pakistan’s right to self-defence; and urged India to refrain from the threat or use of force.” Pakistan Lie Busted Again! Lockheed Martin Not Suing India For Claiming MiG-21 Shot Down F-16 Fighter Jet. This OIC resolution on regional peace and security in South Asia also welcomed Pakistan Prime Minister Imran Khan’s renewed offer of dialogue to India and the goodwill gesture of handing over the Indian pilot, the FO said. The resolution called for “restraint and de-escalation” as well as the need to resolve outstanding issues through peaceful means, it added. Pakistan’s Foreign Minister Shah Mahmood Qureshi boycotted the inaugural session of the 46th sitting of the Council of Foreign Ministers (CFM) of OIC meeting on Friday where Sushma Swaraj attended as ‘Guest of Honour’ and delivered a speech. She was the first Indian minister to address the OIC meeting.